Alexandra Smith earned a Bachelor of Science in Biology from Bryan College, and graduated with a Master of Science and Doctorate in Audiology from the University of Tennessee. Dr. Smith holds her Certificate of Clinical Competence awarded by the American Speech and Hearing Association, and she is a fellow of the American Academy of Audiology. Dr. Smith provides diagnostic hearing and tinnitus evaluations, and prescribes amplification and assistive listening devices. She also specializes in comprehensive vestibular evaluations and electrophysiology. 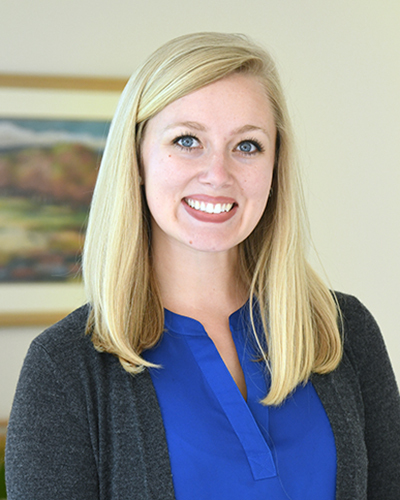 Alexandra especially enjoys the counseling aspect of aural rehabilitation, helping patients reconnect with loved ones through improved hearing. Her special interests include humanitarian audiology, since she grew up doing international non-profit work and most recently had the opportunity to work with a medical team in Belize. She also serves as a member of the Coalition for Global Hearing Health. Alexandra completed her clinical fellowship year here at Greater Knoxville Ear Nose and Throat, which is why she considers the GKENT team like family. Dr. Smith has resided in Knoxville for 4 years with her husband, Tyler, and their Australian Shepherd, Berkley. You’ll often find them traveling and exploring the outdoors.